What is Vietnam visa on arrival airport? Vietnam Visa on arrival airport is the type of visa services to help foreigners get a visa to Vietnam at one of the International airports in Ha Noi Capital, Da Nang City, Ho Chi Minh City, Phu Quoc Island, Cam Ranh airport. Instead of visiting the Embassy or Consulate of Vietnam like the transitional ways, forefingers simply apply for the visa through our website. It takes less than 2 minutes to complete the “ visa application form” after some working days or 3 hours for urgent cases, you will be received your “Vietnam visa approval letter”. What is the visa approval letter? Visa approval letter is a document issued by the Vietnam Immigration Department that permits foreigners to enter and exit Vietnam in a given period of time. After having the visa approval letter, you can get onto your plane and receive visa upon arrival at one of the give major international airports in Vietnam (Hanoi, Hochiminh City, Da Nang, Phu Quoc and Cam Ranh). There is one important thing you need to know that the visa approval letter is NOT acceptable for those who enter by crossing BORDERLAND or by SEAPORTS. Note: Vietnam visa approval letter is usually issued in group and therefore, you may find some of your passport detail in the same letter as other people. What are the benefits of the visa on arrival? At the moment, how many types of Vietnam visa on arrival are there? 1 Month single entry: You are permitted to enter Vietnam ONCE during 30 days your visa validity. After exiting Vietnam before the visa validity, it will automatically become invalid. You need to apply for a new visa if you want to re-enter. 1 Month Multiple entries: You are permitted to enter Vietnam as Many Times as you want during 30 days your visa validity. 3 Months single entry: same as 1-month single entry visa, but it valid for 3 months period. 3 Months Multiple entries: same as 1-months multiple entries visa but it valid for 3 months period. 6-Months Multiple entries: You are permitted to enter Vietnam as Many Times as you want during 6 months your visa validity. 1-Year Multiple entries: You are permitted to enter Vietnam as Many Times as you want during 1 year your visa validity. Business visa: valid for 1 month/ 3 months with both type of single or multiple entry; 6 months, and 1 year (multiple entry). What is the difference between the single entry visa and the multiple entry visa? – For single entry visa: You can enter and exit Vietnam only ONE time during the visa validity. If you wish to re-enter you need to apply for a new one or choose the multiple entry visa. – For multiple entry visa: You can enter and exit Vietnam with unlimited time as you want during your visa validity. How to apply for an approval letter? How long does it take to get the Vietnam visa approval letter? 2 working days (standard service) and 2 to 4 working-hours (urgent service or rush service) for the tourist visa. 3 – 4 working days ( standard processing time) and 1 – 2 working days ( urgent service) for the business visa. Note: during the weekend and Vietnam public holiday, foreigners can only apply for the tourist visa. – Print your Vietnam visa approval letter out and fill out the entry & exit form ( it could save your time on check-in procedure on arrival airport), 02 passport type photo size 4×6 white background. 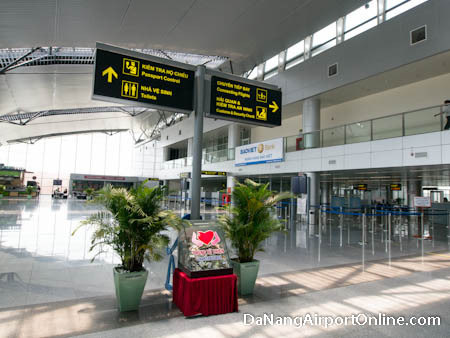 Hanoi Airport Map – Hanoi airport visa-on-arrival counter. 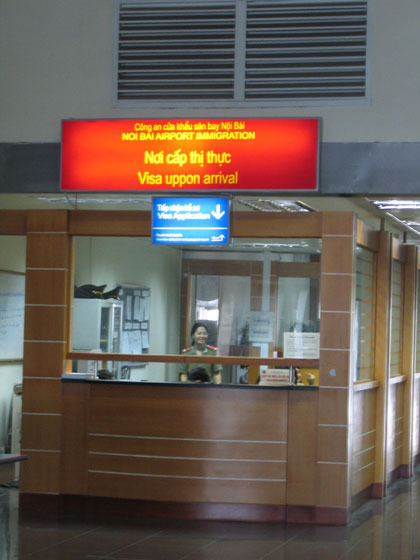 Ho Chi Minh city Airport Map – Ho Chi Minh city airport visa-on-arrival counter. Can I use the Vietnam visa approval letter for my entry by sea by land ports? If you want to enter Vietnam by land please contact directly with us via email for further support. To traveling to Vietnam, your passport must be valid for over 06 months period. Sometimes, visa agencies forgot your passport validity and applied visa for you with your detail, but you will be refused to take the flight to Vietnam when your passport valid less than the period required. Therefore, Kindly make a new your passport before applying for your visa. Should you provide us with the exact date of arrival? It’s not necessarily. Incase you have booked the flight ticket to Vietnam so you can put the exact date of arrival otherwise it should be the earlier than your plan. For example, you applied for the 3-months visa with arrival date as Dec 5th, 2018, the visa letter will be valid until Mar 5th, 2019. You can arrive anytime between this period but should leave the country by Mar 5th, 2019 or apply to do visa extension before it is expired. Note: The Vietnam visa approval letter could not be amended once it is issued, so you have to apply for a new visa if you want to visit Vietnam earlier or change it to another type of visa. How long in advance should you apply for a Vietnam visa? Foreigners can apply for a Vietnam visa on arrival 6 months in advance. 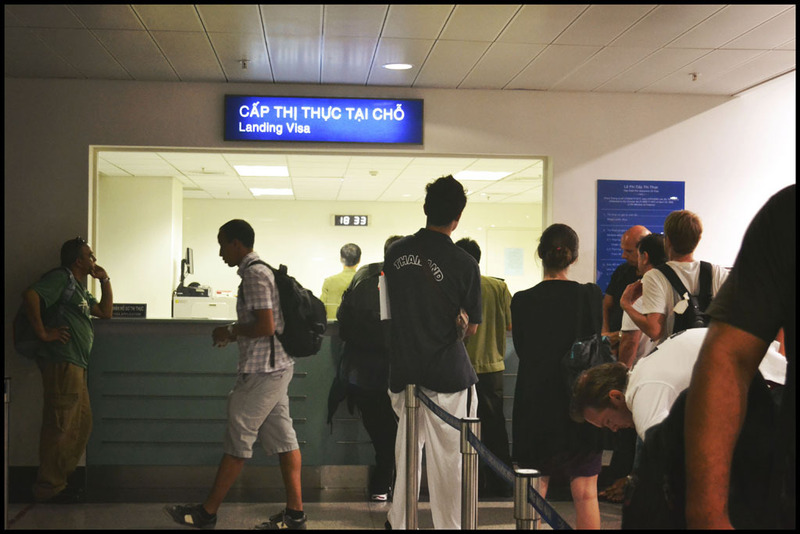 Although it takes less than a week to get your visa approved, it is strongly advised that you apply for a visa to Vietnam from 1 – 2 weeks before your arrival time to avoid any unwanted problems. What is the cancellation and refund policy for visa application? All the fees will be refunded in case your application is refused by Immigration Department. No refund will be given once your visa approval letter was approved by The Vietnam Immigration and was delivered to your email given the visa approval letter. No refund will be accepted in case you apply for the visa containing incorrect details caused by mistakes from your side. We strongly recommend you check again before confirming on application tool and after receiving the visa approval letter. Any mistake MUST be solved with 24 hours after we sent you the result. Later than this period, we refuse to refund for your application. What if you change your flight and arrive at another airport in Vietnam? Vietnam visa approval letter is acceptable at all International airports in Vietnam. It include: Tan Son Nhat (in Ho Chi Minh City), Noi Bai (in Hanoi) and Da Nang (in Da Nang city), Cam Ranh (Nha Trang city), Phu Quoc( Phu Quoc Island). There is no problem when you are arriving at one of these five airports. Which information is required when I apply for the Vietnam Visa online? Your full name in your passport. Your nationality is shown in your passport. How to avoid any mistake on the visa application form? 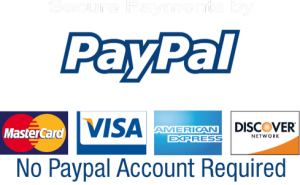 What payment methods are accepted for online payment? We’re currently using PayPal app, which is professional with the highest and most modern security systems to prevent risks of stealing, misusing data, and fraud for this website. Also, if you want to pay via Western Union please contact us to get our detail. Do Vietnamese, who residing overseas with a foreign nationality, need a visa to Vietnam? – you can apply for the 5-year visa exemption. Please click here for more details http://mienthithucvk.mofa.gov.vn. Can I extend my visa when I am in Vietnam? Yes, you can. Please send us the scan of your passport and the pages containing your current visa and last entry stamp to our email [email protected]. we will check and let you know the current extend fee. Thanks to the open policy to welcome all travelers to Vietnam on business or holidays, getting a Vietnam visa is now simpler and easier than ever before. Besides applying for visa to Vietnam at Vietnam Embassy, international travelers now can enjoy a much more convenient way to get Vietnam visa which is applying for Vietnam visa online.